A row broke out yesterday over the President’s directive to governors on workers’ salaries. Governors said President Muhammadu Buhari did not say they should pay all arrears of salaries before Christmas. But workers threatened to vote out governors who may fail to pay. After a meeting at the Presidential Villa on Monday, President Buhari directed Finance Minister Kemi Adeosun and Central Bank of Nigeria (CBN) Governor Godwin Emefiele to release the balance of the Paris/London Club refund to states to enable them pay salaries. Governors Rochas Okorocha (Imo) and Nasir El-Rufai (Kaduna) briefed reporters on the outcome of the meeting. Yesterday, the governors denied that the President said they should pay all arrears of workers’ salaries before Christmas. Besides, a statement by the Nigeria Governors’ Forum secretariat said given the delay in the past between when the President gave a directive and the actual release of funds, the money might not get to the states before Christmas. This might have set a stage for a battle between the governors and workers. The statement said: “The governors had expressed profound gratitude to the President for his magnanimity in hearkening to the needs of the states and understanding with them towards helping to solve some of the intractable financial problems of governance, top among which is the lingering problem of workers’ salaries. The governors recalled that the President had remarked that, ”I will not be saying much because the responsible ministers are here: Finance, Budget and Planning and the Central Bank of Nigeria. I request you to appoint your own team to come and sit down with them (referring to the governors). “This should be done, not only for next year’s budget but for this Christmas. The Minister of Finance, Budget and Planning and the Central Bank should sit down with you in a sub-committee to see how much can be released before Christmas,” the President said. The statement said that no mention of “all workers arrears”, was ever made, by President Buhari. The statement added “The governors had appealed to the President to once again authorise the Finance ministry and the other officials to hasten the payment of the remainder of the Paris and London Clubs loan refunds as they had factored the monies into their 2018 budgets. “President Muhammadu Buhari’s instruction that the money be paid before Christmas however, draws its background from the series of delays in the previous disbursements to the states by the Finance Ministry, which by commission or omission had ex acerbated and indeed increased the number of months that workers are owed salaries. “For example, the first bailout that President Buhari approved was not paid until October, four months after the President had given approval for the money to be paid. It was the same practice with the first tranche of the Paris-London Club repayment, which was approved in mid-2016 but took until December 2016 to hit the states’ accounts. It is imperative to add that the Paris–London funds were legitimate funds of the states and not loans as several sources had thought. Aremu, General Secretary of Textile Workers Union, said the 2019 election will be determined by how competent a governor has performed in payment of salaries. He said: “If they don’t pay, what will be the moral authority to say private employers should pay? So, they are not only the employers of labour, but they should enforce the law. They are to make sure that employers that are not paying are sanctioned. 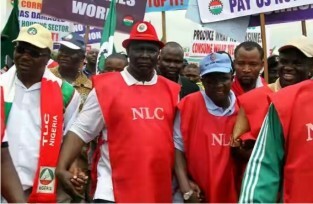 Head of Nigeria Civil Service Union(NCSU) Alhaji Mohammed Kiri who is also a member of the Minimum Wage Committee, said labour was determined to isolate any state that fails to utilize the Paris Club refund for salary payment. He praised Buhari for coming this far and also for giving N800 million each to states as budget support.